Let’s tie some song prompts to creating outlines to songs! Everything you’re doing to learn songwriting should be in a building mode: if you’ve used some of the song prompts, your next step will be to create a song. But how do you go from song prompt, to outlines to songs? We’ll walk you through the entire process from song prompt to finished song! At the end of the prompt, you chose a single moment to write about. Who did you talk to? Was it pleasant? A fight? What did you eat? What did it smell/taste like? What was going on around you? Interesting people? scenery? Goal: take note of how you felt at different points and see if you can spot any themes. 2 Place your 3 or 4 moments into an outline – it can be chronological order, or it can be some other order based on the theme you’ve discovered. 3 Let’s look for some verses! Go back through your outline and written moments and try to find things that stand out to you or are connected. Why these moments vs the Great Dane with an umbrella that ran by? Are they connected some how? Is there one moment that’s stronger than the others? Why? Are there any characters or themes that jump out? Greed, Passion, Anger, Hope . . . ? Did you learn anything about yourself or someone else? 4 Now that you’ve found a scene and a story line or action to go with it, what’s the big take away? This will be your chorus! Did the last couple of bullets in Step 3 reveal the big song idea? Write it down: refine the theme you placed at the top labeled Song Idea! Give it more clarity versus just a single word. Is it about greed and how it can turn your life upside down? How passion can lead to obsession with no resolution for either party? Be specific. Now write about the big message. 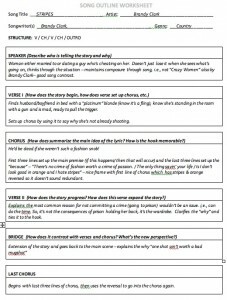 5 Use the song outline worksheet to drop all of your song elements into: the verses, chorus, and bridge if you have one. You’ll also clarify the point of view – who’s the speaker? Do you have a melody in mind? You’ve probably been humming something – go ahead and record it without an instrument. Now sing it as you move through your outline. Wait . . . you don’t have any lyrics broken into line yet? No problem! Don’t worry about lines or rhyming anything right now – just tell the story under your melody. Congratulations on finishing the first draft of your newest song!